This emblem was used as the front-piece to a book published in 1989: Ozone depletion:Health and environmental consequences, edited by Dr Robin Russell-Jones and Professor Tom Wigley. It is an appropriate emblem for Help Rescue the Planet because the book included a chapter on global warming chaired by Sir John Maddox, the late editor of the journal Nature (1966-1973). 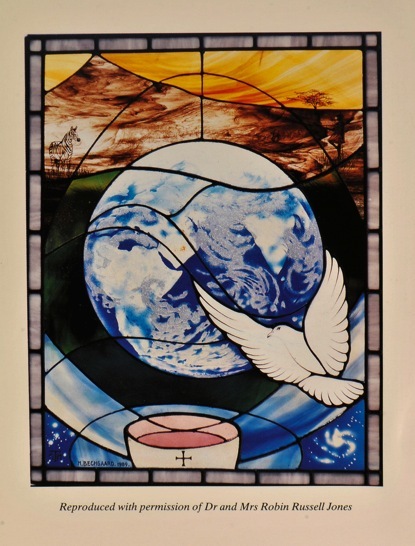 This stain-glass window represents a synthesis between religion and environmentalism which are often thought of, mistakenly in my view, as competing doctrines. Certainly they are different as one is based on faith and the other on reason, but people should have faith that the environmental movement is there to help protect God’s creation; and it does this by relying on scientific enquiry.